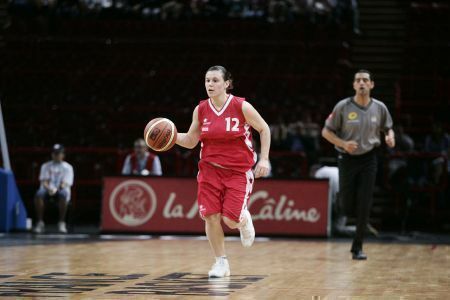 Mondeville last won the basketball Coupe de France in 2005 and were in no mood for it to escape their grasp this season. 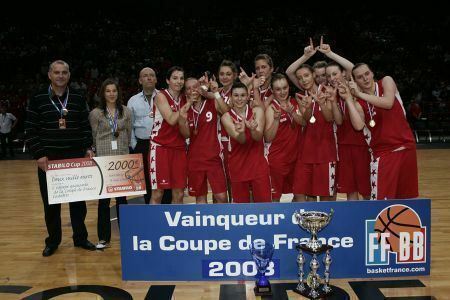 One of the most interesting aspects of both sides’ rister is that five players from the Île de France Pôle Espoir team from 2005 were on display, three players for USVO and two for Mondeville. All five players were to make an impact in this match. USVO were in a hurry to get this match started and found themselves on the free-throw line within five seconds of the tip-off. 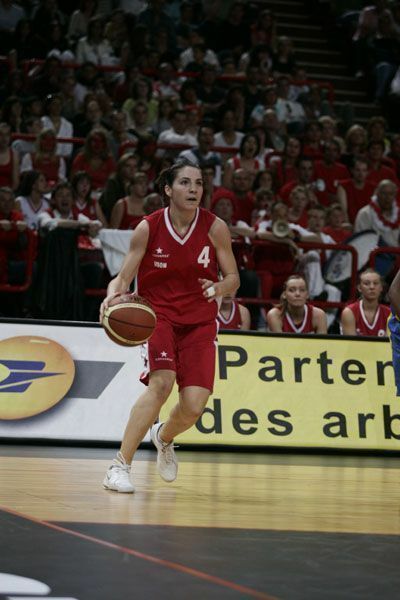 Bettina Kidila was unable to connect with either throw, but it did not matter as Céline Girald was on hand to score with only eight seconds on the clock. Aminata Konate (left) got her first period display as she put her side 5 points clear (5-0) with two minutes gone. Kelly Corre (below) was the first player from Mondeville to get into her stride to score 6 straight points as her side went briefly into the lead (6:5). The quality of play was rather disappointing as nerves crept into the game hence accumulated in poor finishing on either side. 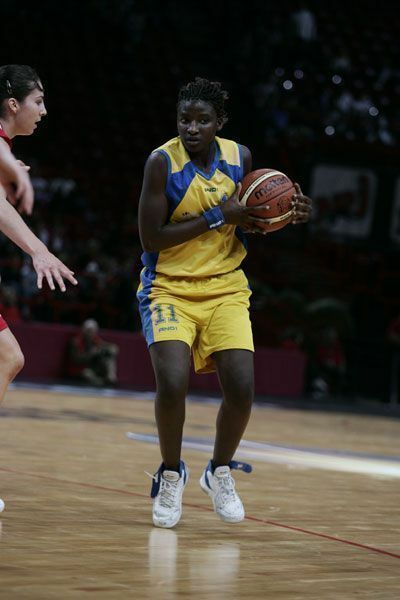 Konate was the only USVO player in the first period that showed her class to finish with 7 points and 5 rebounds during the first quarter. While Corre ran the show early on for Mondeville by also scoring 7 points, it was the intervention of Stéphanie Dufour and the crisp passing of Caroline Trottin that allowed them to stay in contact as they trailed (13-17) after the first period. USVO continued to dominate the boards during the second period and held on to their lead (21-19) midway through this quarter. Marion Chartereau had been rather transparent during the first 15 minutes of the game. 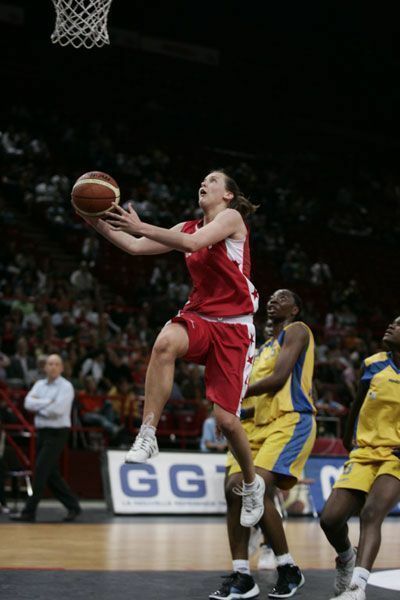 However she started the Mondeville revival as she concluded a nice transition move off the pass from Corre. This was quickly followed by Corre’s score to tie the game (23-23). USVO, now under pressure, became more reliant on Konate, who did eventually restore the advantage. Trottin (left) who was having a field day by dishing 7 assists in total hit the shot of the first half from behind the arc to put Mondeville back into the lead (27-26). Melissa Micaletto was not having a game to remember. Finally she showed a burst of speed to draw a foul and then hit the free-throws for Mondeville to go into the interval (28-27). Konate picked up her third foul early in the third period. As a result she had to sit out most of the period for Bouare (right)to then lead the USVO offensive. Bouare’s efforts paid off as USVO regained the lead with a maximum of 5 points (40-35). Three pointers were hard to come by in this match but Pauline Routabol from Mondeville had no problems in this department as she hit one from downtown. Duffor who had been pounding the boards all during the third period tied the game (40-40). Mondeville started to run at their opponents more and drew fouls to hit 5-from-6 from the charity stripes to go into the final period with a 5-point lead. USVO’s poor free-throwing in this match came to hunt them in the final period as they only managed to score 5-from-14. Yet their game plan was based on Konate. For Mondeville the duo of Corre and Duffor had done most of the damage and Trottin was dishing out the assists. Yet their side really needed Micaletto to come into the game. Mondeville still held the lead because of the poor free-throw percentage from their opponents (51-49). However they did not look comfortable. Micaletto above then came out of the shadow of her opposite number and dished out a couple of nice passes for her team mates to score before hitting her first field goal of the match as Mondeville stretched their advantage (58-51). Konate was now under pressure and tried in vain to save the match for USVO. But her team mates’ failure to hit free-throws in the final minutes cost them dearly as they were not able to reduce the deficit. Hence Mondeville went on to win the match with Corre taking the MVP award for her 18 points and 17 rebounds. Dufour also compiled a double-double 19 points and 10 rebounds. 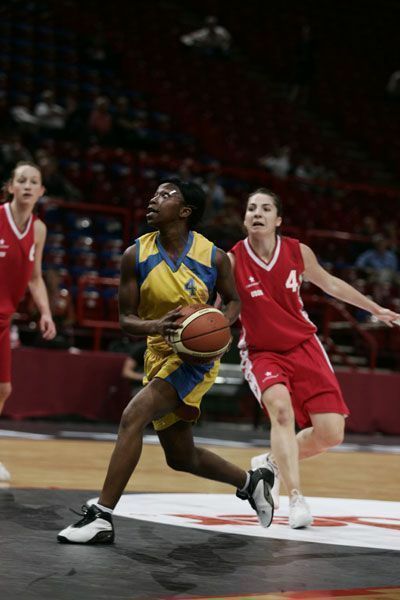 Konate led the scoring for USVO with 18 points.